Developmental Biology is a diverse and important discipline within life science since it covers some of the very fundamental processes of life: such as how simple cells give rise to complex and structured multicellular organisms, how cells repair themselves and how cells age. It is now possible to track the fate of an individual developing cell, or look at processes at higher levels within tissues and organs over their entire lifespan. Well-established model organisms such as Zebrafish, D. melanogaster or C. elegans can be used to provide us with valuable insights into processes including: nerve impulse propagation in neural circuits, the function of ventricular pacemakers in heart models or more widely, cancer research, neurodevelopmental disorders, tissue regeneration mechanisms, or screening of toxins for potential roles in developmental defects. A key part of many of these studies is the imaging of the fluorescently labelled cells, tissues or whole organisms. To do this effectively, especially for live cells, the camera needs to have excellent sensitivity to discriminate the detail of the sometimes faint signals of the fluorescent markers or tags that may be used against the background noise. In addition, the camera must be capable of a wide field of view so we can see as much of the subject under study in one view as possible. sCMOS cameras are regarded for their large sensor sizes and ability to run at high speeds which means that large areas of samples can be imaged rapidly. The latest sCMOS cameras with back illuminated technology provide even greater sensitivity making them suitable for imaging samples that have low fluorophore signal levels, or when using techniques such as TIRF. A near perfect 95% QE and low noise means that the Sona is highly sensitive. Sona 4.2B-11 provides a massive 32 mm Field of View from its 4.2 Megapixel sensor - the large field of view allows more of the subject to be observed in a single image without stitching. Sona 4.2B-11 is fast – 24 fps at full resolution (2048 x 2048), and 48 fps when high speed mode is used. Detect small changes in fluorophore intensity With 95% QE and the deepest cooling available, the lowest possible noise is achieved from the GS400 BSI sensor, making Sona the most sensitive sCMOS camera available. Sona is perfect for detecting small changes in signal intensity. This means you can keep fluorophore levels and exposures as low as possible for more accurate cell physiology and reduced photo-toxicity effects. 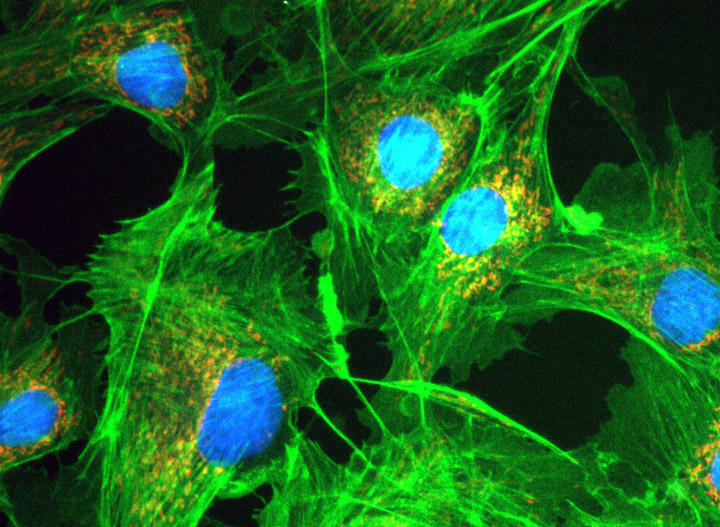 Result – Use low fluorophore and exposures for more accurate cell physiology. View the largest possible sample area Sona 4.2B-11 features a massive 32 mm FOV from its 4.2 Megapixel (2048x2048) sensor with 11µm pixels. This is 62% larger than competing cameras using the same sensor and over 114% larger than cameras restricted to a standard C-mount format. This allows larger areas of cells, or whole embryos to be seen in one image, with less need for stitching. Result – View the largest possible sample area and accelerate experimental throughput. View dynamic events with excellent temporal resolution View dynamic events like nerve impulse propagation or cardiac cell function with excellent temporal resolution. With speeds of up to 48 fps at full frame (2048x2048) , ROIs boost speeds even further (e.g. 378 fps at 256x256). Sona lets you view the subtle yet significant changes in cell physiology. Result – observe changes in dynamic aspects of cell function. Quality and Longevity Sona comes with Andor’s exclusive UltraVac™ vacuum sensor enclosure. The well proven permanent vacuum process is critical not only for cooling, but for protection of the back-illuminated sensor against moisture and condensates. Result – Sustained high performance, year after year.